This year we continued our tradition of cutting down a Christmas tree from our woods (go here to see last year's tree). 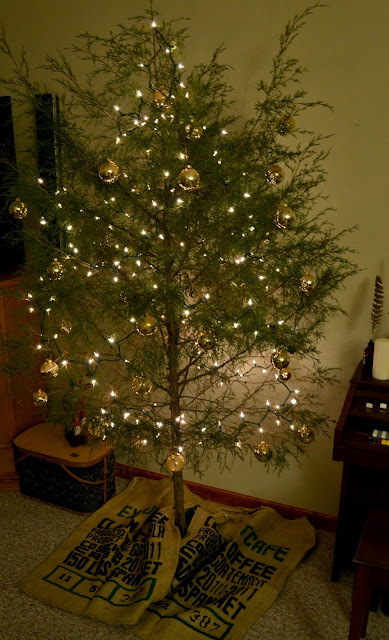 We had one evergreen tree in the middle of the back yard that was really out of place so David gave it the ax this year and brought it inside. Of course it's not a perfect frasier fir, but I think that makes it all the more charming. This year's tree was quite a bit smaller than last year's so that made it easier to handle and decorate. Last year at a local antique store we found three boxes of old ornaments for only $0.25 per box, so we snatched them up. We like to go with lots of the same ball ornaments on our tree and wanted to switch it up from the red that we normally do, so these were perfect. They were gold originally, but due to their age (maybe 15 years old?) some of the gold had rubbed off and left a nice patina effect. I wanted to use a different tree skirt this year, too, as our white glittered skirt didn't really fit the theme I was going for. I remembered a couple of burlap bags I bought at the feed store a few months back just because I love burlap sacks and they were only $1.50 each. I tried them out on the base of the tree and decided it was a go. We normally use colorful retro bulb lights on our tree, but I wanted to go with plain white this year. I got a couple boxes of lights for only $2.50 each and strung them up to complete this year's tree. The cats like to be around the tree (luckily they don't try to pull off the ornaments or lights) and have been smart enough to figure out how to move the burlap bags to get some drinks of the tree's water. When added all up, the total cost of this year's tree came out to a whopping $8.75! I love a good deal, especially during the holidays. Do you decorate your tree the same way every year, or do you like to switch it up? Thanks for showing pictures of your tree! I like the white and gold with the fir and rustic burlap...it's a nice contrast. We tend to decorate the same every year with small changes here and there. One year our tree fell over and smashed quite a few nice glass ornaments, but it gave me a reason to pick out a few more. Blessings! Oh I just love your tree!!! That was a steal getting those ornaments for that cheap. I had received a whole bunch of nice gold & silver ornaments from someone on Freecycle a few years back, but we use our "eclectic" mix of ornaments instead (that mostly consists of homemade ornaments from the kids and ones we've picked up along the way during our travels). Growing up - we lived in town; Dad hunted and he'd take us out into the woods. Being in Fla. it was all "scrub oaks" and we'd have to cut down 4 or 5 little pines and wire them together to make one. They were still scrawnie - but once you added decorations, lights, long silver icicles and your star - it would be the most beautiful tree ever. I love the rustic simplicity!! LOVE your tree! It's simple, elegant and rustic all at the same time. We have our tree up but not decorated yet, I need to get on that ASAP! I love that your tree is from your own property- how neat! That looks fantastic! And it's funny that the cats found a way to get to the water, lol. I love your tree and your sense of frugal. It looks beautiful. Your tree is a natural beauty...! Just a little sparkle to add the season's magic is all she needed! Lovely and frugal! We do our tree's a little differently each year. I collect( blown glass ) Old Fashioned Christmas Ornaments so it's always a treat to add to our collection every year...They even have chickens and roosters which I am definitely adding this year! So sweet...I love it! We are looking forward to putting up our decorations soon too...we wait til just a week before Christmas to get our tree...a tradition here. Have a great day!! The tree, and cats are totally beautiful but I'm having a hard time seeing anything but that vintage looking globe. OMG. I'm in love! I've been on the lookout for a perfect vintage one forever! Jane - I searched for the perfect vintage globe forever, too, and found this one for only $5 at a flea market! One of my favorite finds ever. So pretty and rustic, perfect for your country home! Our tree is smaller, too, this year. I've had some of the same decorations for years, gifts or special unique ones. But I always try to buy at least one new ornament each year. Enjoy your beautiful tree! Tammy! hi! what a cute kitty? i had a Siamese once but she got left outside in the early autumn, cool nights and she caught a cold and died. :p not good. i love your pursuit of a real tree. you go girl!!!!! and ...thank you for following as a newest follower! awesome! you won't regret it = promise. Your tree look beautiful, I always love the decorated trees and lights. Have a great weekend. Sweet tree, Tammy.. And a good price.. smile.. I generally switch it up some but always use our first ornaments form 42 years ago..
Sweet and simple! Your cats are cuties. I love the simplicity of your tree, it's so charming! I like the shot of the ornament with your reflection, too! It's kind of fun to see cats reactions to a new tree in the house. So cute! Glad to hear you are enjoying the holidays! The white lights and gold balls look awesome! I love switching up my tree every year. I guess that's why I have so many Christmas items. I can't get rid of them because next year I might want to use them. I'm all about getting decorations at the thrift store or using natural things. I love you tree. I like simle themes the best. I do change my tree up a bit about every three years or so. I did not have the time to change my theme this year. I have been too busy with my grandchildren. But I will watch the after Christmas sales and pick up some new decorations for next yer. Thanks for stopping by. Great find on the ornaments - they look perfect on your tree! Very festive and so nice to be able to cut a tree from your own property! I have a "plant a living Christmas tree" kit that has been sitting on my office shelf for a while now, your post has inspired me to take it down and plant it! Thanks for stopping by my blog (Mommy's Magical Mountain). I love your little tree. It's simple, yet perfectly beautiful! Your tree is adorable, and your cats are so cute! We change up our decorations every year too, at least a little bit. This year I want to do and all red and gold theme. So happy to guest hostess this week's Sweet Saturday :) It's up and running on my end: http://jessica-healthymommyhealthybaby.blogspot.com/2012/11/sweet-saturday-chocolate-chip-banana.html. Have a great weekend! Wow, what a beautiful tree! I love EVERYTHING about it and your decorations. I'm going to have to show my daughter. She was just lamenting that we don't have anywhere to go and cut down our own tree. She will love this too! Tammy, I love your style. The tree is beautiful and I adore those ornaments! We let the girls pick an ornament out every year and put the dates on the bottom so that when they are older they will take them to their own homes. Eventually, I'm hoping to have some beautiful vintage ornaments as well. Love the tree skirt too ! Tammy I love your precious tree and those ornaments the color is beautiful. I am your newest follower. Please come back anytime to Hibiscus House we would be so glad to have you. Your tree is completely charming! The tree is lovely- I love the simplicity. Nicely Done!! Tammy, I have highlighted this post over at Hibiscus House for the Farmgirl Friday Blog Hop. Thanks for such wonderful posts. What a lovely and meaningful way to decorate your tree. We cut our tree from the woods every year, too. Thanks for linking up on Wildcrafting Wednesday. Wow!!! what a frugal tree. I liked it very much. Thanks..